Abekawa-Mochi, the specialty of Fukui Prefecture, is the pairing of Kuromitsu* and Kinako** with mochi. It is rare to eat mochi with just Kuromitsu and Kinako, and such culture can only be seen in the northern region of Fukui. 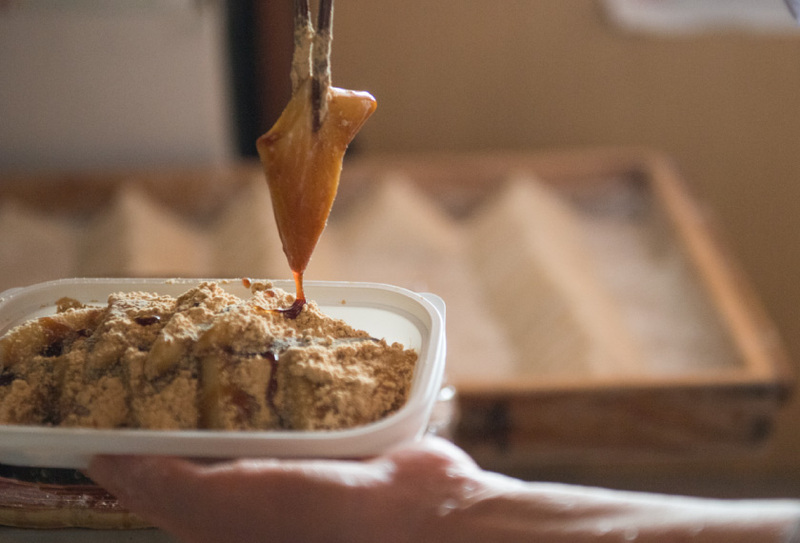 Together with the tradition of eating Abekawa-Mochi to overcome the summer heat and being a long time favorite amongst the locals, Abekawa-Mochi is a true specialty of Fukui Prefecture. Depending on the Abekawa-Mochi store you visit in Fukui Prefecture, you can see a variety of shapes such as circle, triangle or square shaped mochi. The Daikichi Mochi is finely aligned in its triangular shape. 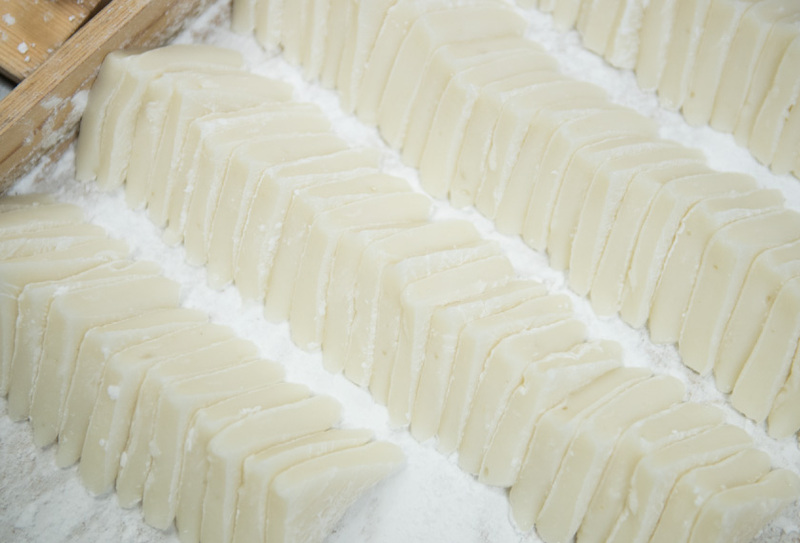 The secret to its tenderness you feel upon picking up the mochi with your chopsticks lies in its exquisite thickness and precisely adjusted moisture level. The delicious taste and gentle texture will surely make you want to go for seconds. Our thick and lightly sweetened Kuromitsu is made purely from the black sugar grown in Taramajima of Okinawa Prefecture. The syrup is boiled together with a hint of salt which has a unique light aftertaste. If you have the chance to visit our store, don’t miss the lightning speed of our artisans. They will dip the mochi in the Kuromitsu, take them out, and sprinkle it with the Kinako in the blink of an eye. 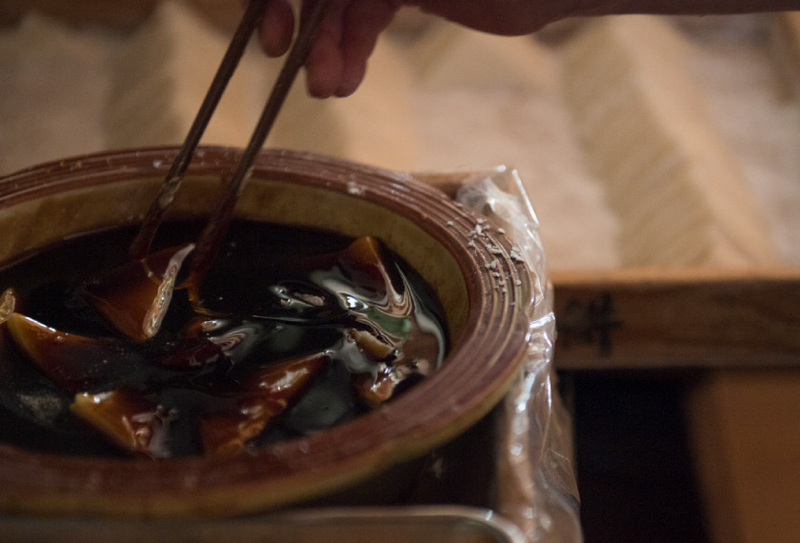 You will be fascinated by the Abekawa-Mochi prepared right in front of you. Our Kinako is made from the soybeans grown in Fukui Prefecture. You will sense the flavor of the soybean and enjoy its delicate aftertaste. The Abekawa-Mochi in our store goes through not once, but twice the process of dipping the mochi in Kuromitsu and then sprinkling them with Kinako. 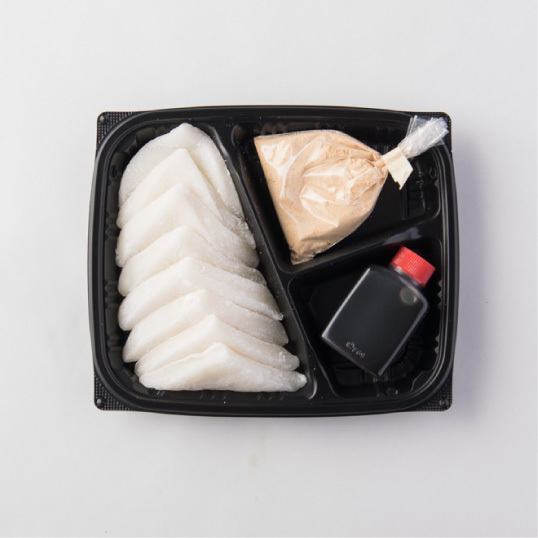 The finishing touch bringing out the best of the rich Kuromitsu and Kinako will definitely increase your appetite. 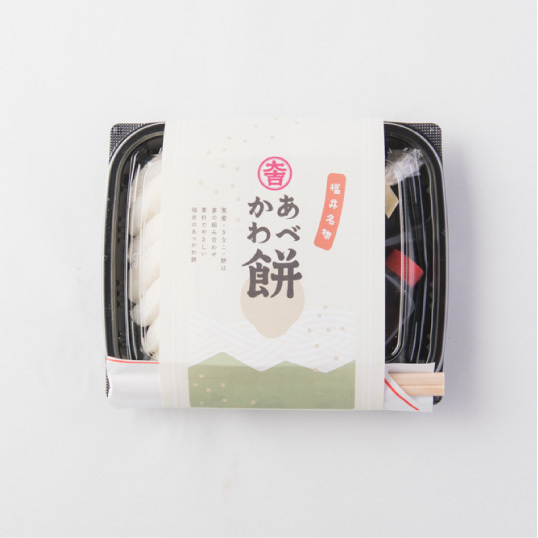 Please choose from the Abekawa-Mochi made in the store (10 pieces or more) or the packaged Abekawa-Mochi which comes with a separate pouch for the Kuromitsu and Kinako (8 pieces). The packaged Abekawa-Mochi can be enjoyed by dressing the mochi yourself. It will be a great gift, if it can be consumed on that day.